Are you a dentist, plumber, restaurant, or other business that caters to local customers. If so, the search engines have made it possible for you to play ball in the search results pages. We optimize your site to get you more traffic that matters. Your links will come from quality sites with unique content. This means your website will get noticed faster and rank higher. We make sure to keep you on the good side of the ever changing Google algorithm. 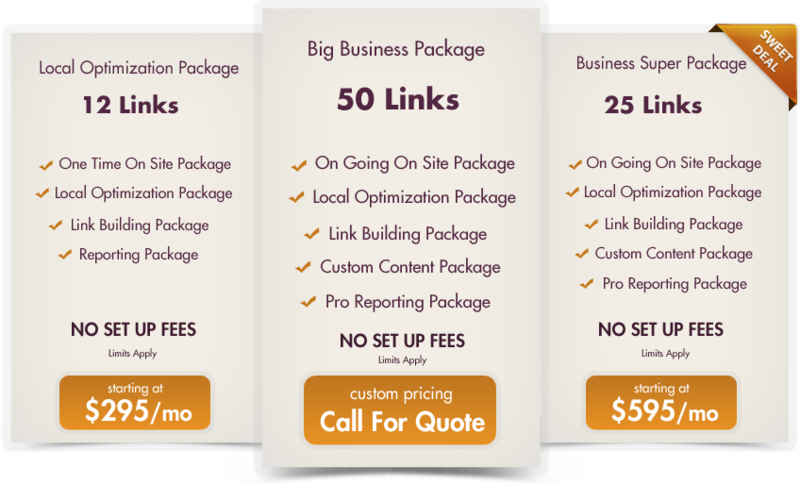 We believe in the long term success of your links and build accordingly. Today's competitive websites have to have unique content that shows immediate value to the search engines as well as your qualified visitors. Our content package will help your blog not feel so barren. Our articles will also help your site get indexed faster and hypnotize your visitors. Your business is flexible, so are we. All of our services can be broken out individually so you can take only what you need and save some cash in the process. Give us a call. We would love to help your business get more visibility in the online world.